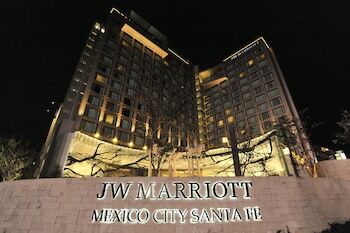 With a stay at JW Marriott Hotel Mexico City Santa Fe in Mexico City (Santa Fe), you'll be a 5-minute drive from Teatro Zentrika and 6 minutes from Centro Santa Fe. Featured amenities include wired Internet access (surcharge), a 24-hour business center, and express check-out. Event facilities at this hotel consist of a conference center and meeting rooms. A roundtrip airport shuttle is provided for a surcharge (available 24 hours), and self parking (subject to charges) is available onsite. Located in Colonia Juarez (Zona Rosa), Suites Havre is within a 10-minute walk of Biblioteca Benjamin Franklin and Cuauhtemoc Monument.